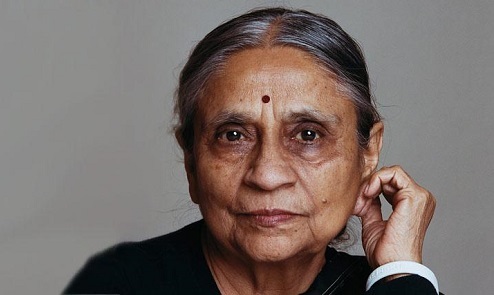 Ela Bhatt, Founder and Former Secretary General of Self-Employed Women’s Association (SEWA), describes how growing up in the political and social atmosphere of India’s independence and the Gandhian movement led her to found an organization devoted to the advancement of poor, undocumented women in India in the 1970s. She narrates her education in law and early career, discussing how her experiences in the Textile Laborer’s Association, and her involvement with the Textile Laborer’s Union impressed upon her the idea that organization and coordination were essential to bring change to the plight of India’s poorest laborers. The very first step in Bhatt’s journey was to overcome ingrained notions about the definition of work in society, which centered on an employer-employee relationship. Excluded from this definition were the thousands of women who worked either in the home—sewing, weaving, or tending to livestock—or who worked in India’s open markets selling vegetables, food grains, and spices. These unprotected laborers accounted for roughly 90% of India’s entire workforce, and women, Bhatt points out, made up a large percent of this group. Because of their unprotected, unregistered status, these laborers went without the most basic securities—including healthcare and social security, as well as access to capital, food, and education. These factors were critical to Bhatt’s decision to “work for those who are unprotected and unorganized” by founding SEWA in 1972. In the interview, Bhatt reflects on what she termed “the highest priority” in the early days of SEWA—gaining access to capital so that women could own the means of production and would no longer have to rely on hawkers and middle men. Despite the nationalization of many Indian banks at this time and the growing emphasis on poverty reduction, Bhatt met with resistance from establish banks, which refused to lend money to the poor. The solution—Bhatt opened SEWA Cooperative Bank in 1974. She faced major pushback, not only from the registrar of the cooperative, but also from her family, who warned that the women were poor and therefore untrustworthy. They predicted that the women wouldn’t repay their loans on time, and that Bhatt would have to commit suicide for loss of her reputation. But Bhatt was not deterred. “I had to trust in the women,” she explains, “because they were so highly exploited by existing institutions.” In the interview, she talks more about the founding of SEWA Banks, as well as her involvement in the founding of Women’s World Banking in 1979. Bhatt offers one potential avenue for change—decentralization of power, decision making, and control over resources. In the interview, she describes the benefits of a true organic movement to fulfill the basic needs of the people, and the role that the private sector can play in making strides towards the eradication of poverty. "A Discussion with Ela Bhatt, Founder, Self-Employed Women’s Association," Berkeley Center For Religion, Peace & World Affairs., May 17, 2010. "Women and poverty: the hidden face of violence with social consent," The Elders, October 17, 2013. Ela Bhatt, Anubandh: Building Hundred-Mile Communities, 2015. Ela Bhatt, We Are Poor But So Many: The Story of Self-Employed Women in India, 2005. Ela Bhatt and Renana Jhabvala, “The Idea of Work,” 2006. Peter Church, Profiles in Enterprise. Inspiring Stories of Indian Business Leaders, (Roli Books, New Dehli, 2015), pp. 66-83. Interview with Ela Bhatt, interviewed by Geoffrey Jones, Mumbai, India, July 13, 2017, Creating Emerging Markets Oral History Collection, Baker Library Special Collections, Harvard Business School.